Yours truly coaching Community WOD. It’s sometimes difficult to get in a workout when you own a box. Seriously. I rested Thursday and Friday, although I did take Luke for 2-mile walks through the crunchy snow both days. I worked out with the 8:30 athletes today, as Jeff was once again kind enough to coach. Today’s WOD was “Deck of Cards”. We will begin with a shuffled deck. The coach will flip a card, and then announce the suit and value. Complete the required activity and reps. Note: Complete 10 reps for face cards, i.e., Jack, Queen, & King. It should come as no surprise that I completed Option A. Two days of rest may have been just what I needed, as I felt very strong today. Uhm, coach Jeff got a little confused and called out 10 reps instead of 1 when an Ace was drawn. Oh and he did this twice. Whew! Ninety-five pound floor presses felt incredibly light, and I completed all rounds unbroken. I often completed rounds of chest to bar pull-ups unbroken, although I did have to break up sets as time passed. Toes to bar went better than expected, and while I did complete many singles I was nonetheless able to complete sets of unbroken kipping toes to bar even near the end of the workout. I missed 1 box jump, but didn’t hurt myself doing so. That was a relief! I focused on keeping up a manageable pace. 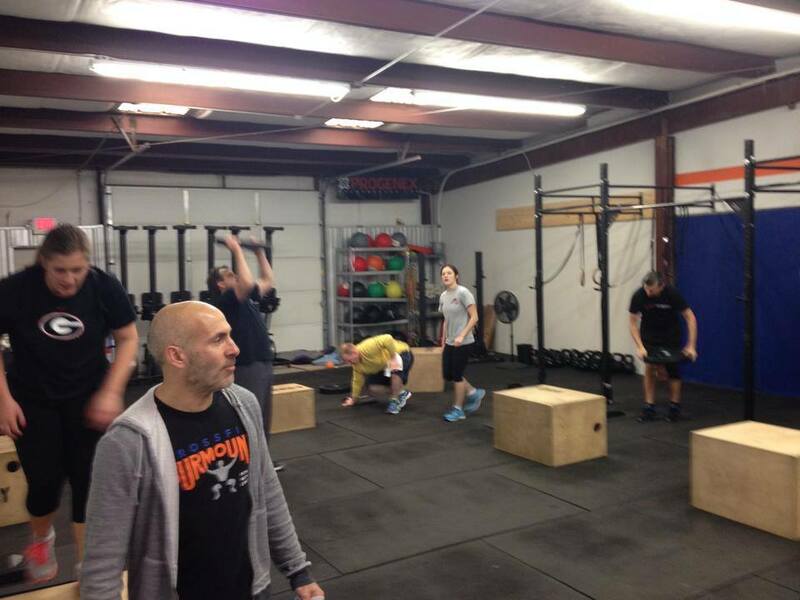 In order from least to most difficult: floor press, chest to bar pull-ups, toes to bar, and box jumps. 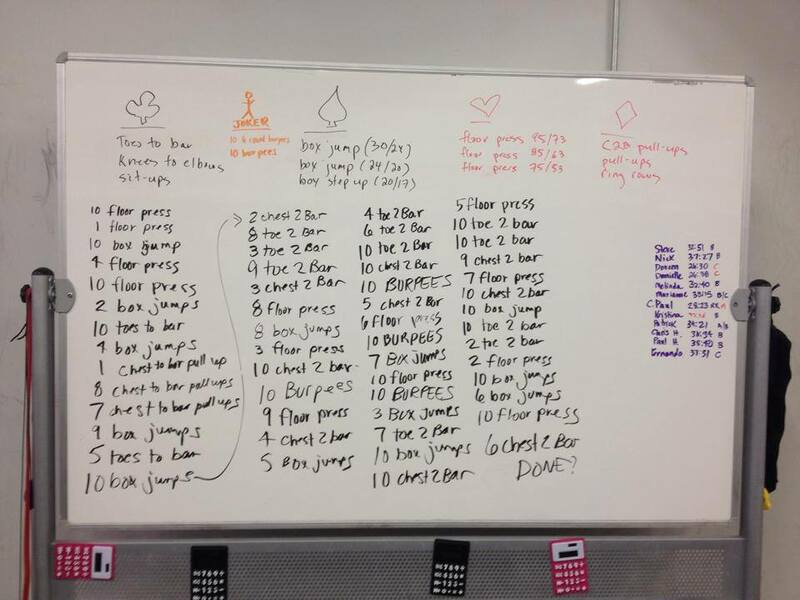 That’s 40 burpees, 85 reps of floor press and chest to bar pull-ups, and 94 reps of toes to bar and box jumps. See what Jeff did there? I had to do more reps of the 2 most difficult activities. Danielle and Doreen crushed me like a tiny little bug.